I decided on which rebounder to get! I've had it for a couple of weeks now, so as promised, I will share what I think of it. Price - It's under $200 even though it seems very similar to the expensive ones. Thicker Bungees - They seem thicker than other affordable bungee rebounders. Lifetime Warranty - This was ultimately what swayed me. They offer a lifetime warranty on the frame and mat. Other rounders only offer three months, or only cover the frame. The fact that they included the mat gave me confidence in their product. The frame and legs seem thick and very sturdy out of the box. The bungees are crimped with metal rather than knotted by a plastic doohickey. I have no idea if that's better or not, but the bungees do seem very durable and strong. I like the pretty shade of green. I actually like all the vibrant colors they offer. It's nice to have a choice. After assembly I immediately began jumping on it to test it out. The frame appeared to be solid and even, though there was the teeniest wobble if I went out of my way to shake it back and forth, likely due to tiny imperfections in the leg or rubber foot manufacturing. There's no wobble at all when it's on a rug. 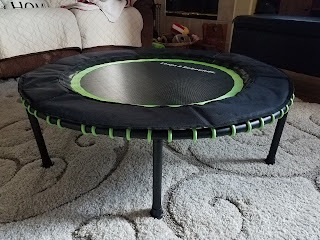 Overall I'm satisfied with the noise level of this trampoline. It's reasonably quiet, and I can use it during movies without bothering the other viewers. Here's a quick little video of what it sounds like. You can hear the slight wobble when it's on hardwood floors, but it's absent on carpet. 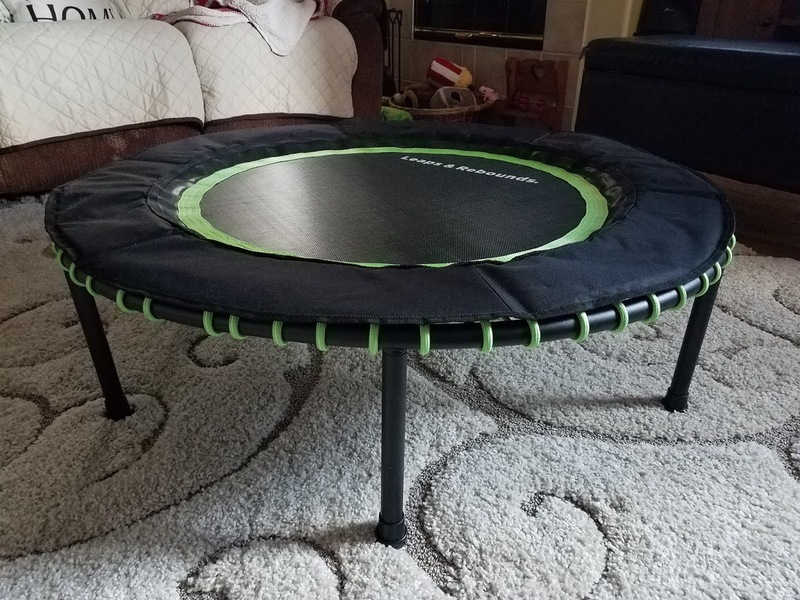 Note that the trampoline isn't enormous, but still big enough to allow room for you and your clingy dog. I like it! As noted above, I think it's the perfect size. It's fairly light. 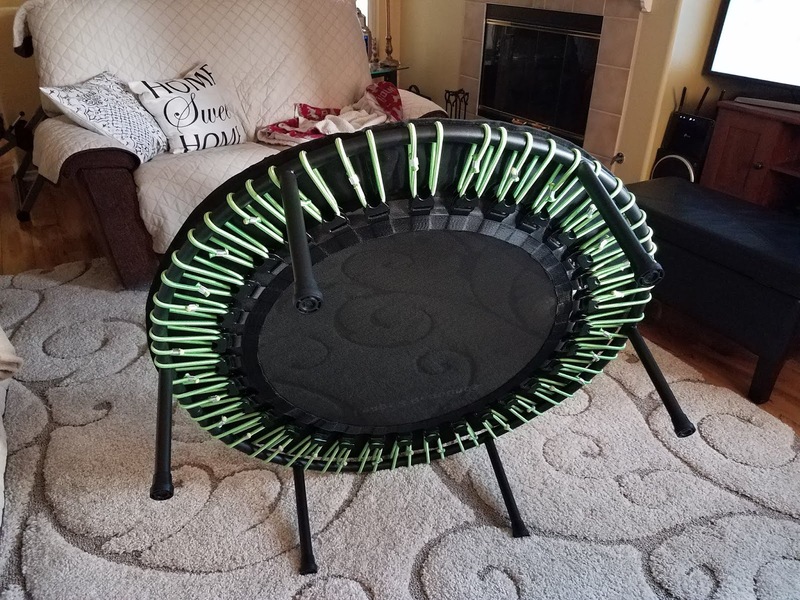 I can easily move it around the room, stand it on its side, and tuck it behind the couch. It can also stand on its own thanks to the legs. It doesn't have to lean against anything. And it doesn't feel so small that I'm afraid of careening off the thing while jumping. I've never been all that coordinated, so it's nice to not worry about that. I like how bouncy it is. With subtle movements, I can initiate bouncing movements. I like to alternate between using my calves, my thighs, or just swinging my arms. Very little effort is needed, but after about five minutes, I can feel my heart rate elevating. It's easy to just get into a rhythm and not be conscious of what your'e doing, which is great when watching a movie. 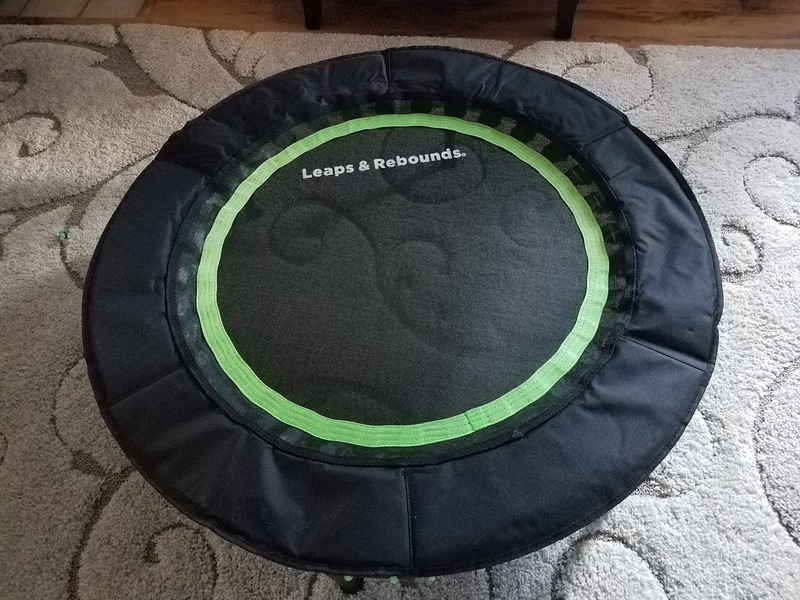 The Leaps and Rebounds rebounder is rated at 249 pounds, I believe. In the video above, the person on the trampoline is about 200 pounds. You can see it's handling the weight like a champ. We both use the rebounder without issues, alternating between gentle bouncing and higher energy jumping. After two weeks of everyday use, no issues have come up. I'm able to jump on this with bare feet, with socks, or with shoes. My feet do feel tired after bouncing on it a while, so I find it helpful to wear shoes with arch support sometimes. While the slight unevenness of one of the legs causes a bit more noise than I like on a hard surface, it's not really an issue since I use it on the rug in front of the TV.